It’s fair to say that AFCON 2015 was an utter disaster for Burkina Faso. They came into the tournament as one of the favourites, hoping to repeat their run to the final of two years before. They left it without a win, with just one point and one goal. Coach Paul Put left, and was replaced by Paulo Duarte, returning after a four-year stint between 2008 and 2012. Since then, the Stallions have begun to recover their form, although it is hard to gauge exactly how good they are. In AFCON 2017 qualifying, they were drawn into what should have been a relatively straight-forward qualification group alongside Uganda, Botswana and Comoros. An early defeat in Botswana left them playing catch-up, though, and it came down to the wire. It wasn’t until Banou Diawara’s winning goal in the ninth minute of stoppage time in the reverse fixture in Ouagadougou that their place was confirmed, vaulting them to the top of the group. Perhaps their World Cup qualification form is more of a hint: another stoppage time goal from Diawara rescued a point at home to South Africa (after two missed penalties! ), while in Cape Verde they picked up a handy 2-0 away win. Once again they will be a difficult team to beat in Gabon. After all, this is largely the same group of players that made the final four years ago, with many now in their prime. The tie with Gabon will once again be crucial. Burkina Faso have typically played a 4-2-3-1 formation over the last few years and they seem to be sticking to this under Duarte. Since before the last Cup of Nations, Bakary Kone has been partnered at the back by Steeve Yago, with the full-backs most recently being Malo and Dayo. Captain Charles Kabore remains at the heart of midfield, alongside Abdou Razak Traore or Adama Guira. Pitroipa and Nakoulma usually act as the widemen, with the Traores through the middle, but they have options for traditional strikers in Banou Diawara and, of course, SFG favourite Aristide Bance. Experience – Both individually and as a collective, this Burkina Faso team goes into the Cup of Nations as one of the most experienced around. The spine of the team is still based around the same core that got them to the final in 2013: Daouda Diakite in goal, Bakary Kone at the back; Kabore in midfield; Nakoulma, Pitroipa and Alain Traore in attack, alongside the old stager Aristide Bance. All of these other than Traore (who was injured) played in the final. It’s a fantastic bonus to have a collective unit that knows how to succeed at knockout football. 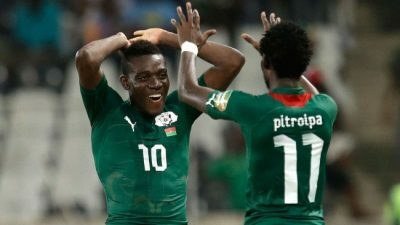 Yet to be tested – The main reason it’s very hard to gauge how good Burkina Faso are is that they haven’t played any of the continent’s top teams since they were knocked out of AFCON 2015. In AFCON qualification, they faced three relative minnows. In World Cup qualifying, they have faced two stronger teams in South Africa and Cape Verde. They still haven’t played a team of the quality of Ivory Coast, Algeria or Tunisia, and one wonders if that may leave them under-prepared. Their experience should counter-act that, but it’s no guarantee. Jonathan Pitroipa – Now 30 and playing out in the Middle East for Al-Nasr, the 2013 Player of the Tournament remains the lynch pin of the Stallions. A quiet 2015 tournament, where African defences got a handle on him, coincided with Burkina Faso’s lack of goals and early exit; when he plays well, the team play well. Banou Diawara – The Smouha SC player is a relatively unknown quantity but he is the form man, having scored in their last three competitive matches. In two of these, he came off the bench to nab vital goals. In the third, he scored in the second minute. By 23, he had already been top scorer in the Burkinabe top flight twice. Paulo Duarte – In his second stint as Burkina Faso coach. This will be his third Cup of Nations, having guided the team to the tournament in 2010 and 2012, in which they exited at the group stage winning a game on both occasions without. Also had a disappointing stint with Gabon. Burkina Faso has conceded just 3 goals in their past 8 matches. The Stallions’ 2 goals conceded in qualifying were behind only Egypt and Morocco in the field. Prior to Burkina Faso’s recent run of success, they had taken just 4 points from 7 matches since the start of AFCON 2015. Burkina Faso also has had difficulty scoring. It has been 17 matches since they have tallied more than twice in a match. In a fairly weak group, Burkina Faso’s chances of advancing are hampered by Gabon hosting the tournament. They have just a 33.7% chance of getting out of the Group Stage. Burkina Faso is projected to finish 3rd in Group A with an average point projection of 3.19. At odds of 96 to 1, just 1.04% to win the tournament, Burkina Faso ranks 4th lowest among the 16 participants.